Yumthang is a beautiful town in the North of Sikkim and is aptly called the 'Valley of Flowers'. Such is the richness of its scenic beauty that the place during spring season is mired with beautiful wild colourful flowers like the primulas and rhododendrons, thus attracting towards it, tourists in hoards. Apart from this, there are various other alluring attractions in and around the beautiful place. Here is a guide to the valley town of Yumthang. Click Here for the Best Hotel Deals in Yumthang. The Shingba Rhododendron Sanctuary is a nature park in Yumthang which is located at an altitude between 3048 mt and 4575 mt above the sea level. The park has about 49 various species of the state flower Rhododendron and many varieties of ground flora like Poppies, Saxifrages, Potentillas, Aconites, Primulas and Gentians. You can also find a few endangered species of animals like the tiger and civet here. The sanctuary is also home to the blood pheasant - the state bird of Sikkim. It is a perfect place to head to with your family for a fun outing. A civet resting on a tree. Yumthang is renowned for its therapeutic hot springs. The hot spring is located close by the Yumthang village and the water here is rich in sulphurated hydrogen. For the convenience of the visitors, there is a hut with two pools full of waters from the hot springs where you can bathe. Travellers coming here can take a dip in these waters and also enjoy the scenic beauty of the place. Yumesamdong is located 16 km from Yumthang and is perched at an elevation of 4876.8 mt above the sea level. The village rests in the arms of nature and is a perfect place to head to for relaxing and rejuvenating yourself. You can also enjoy the wonderful view of the beautiful mountains from here. By Air: The Bagdogra Airport is the nearest airport to the place which has connectivity to various major cities in India. By Train: The nearest railway station is the Jalpaiguri station in Siliguri. This station has trains from places like New Delhi, Guwahati, Chennai and many other important places in the country. By Road: A direct journey to Yumthang is not possible for the roads are always foggy and turn dark by as early as around 5.30 pm. 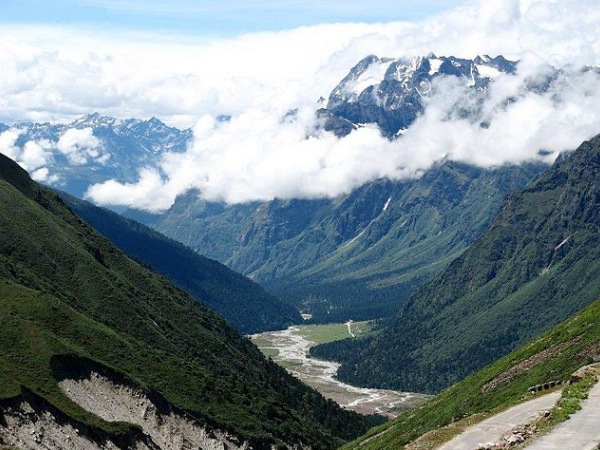 Hence, many choose to travel from Gangtok to Lachung which is close to Yumthang, stay put there and visit the Yumthang valley which is about two hours away. So when are you heading to Yumthang?